Another series of cars could be met on the streets of Russian Federation. These are masterpieces of what can be done having a small budget, or total lack of budget. 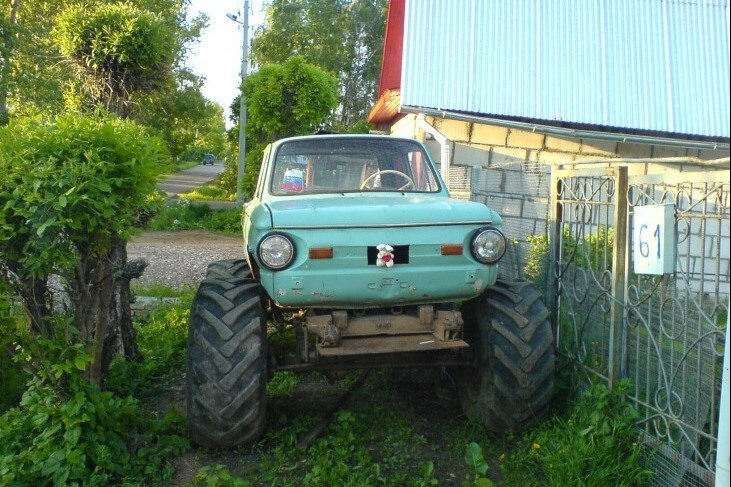 This is Zaporozhets, the cheapest Soviet car. There are thousands jokes about Zaporozhets in Russia. This one could be another joke if it was not real and cruising across this village. Probably it is the only way to move through those roads. Want to get a ride? 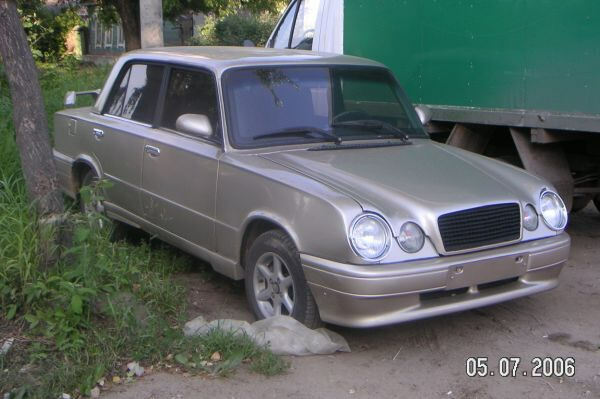 And this is Lada and Mercedes E-Klasse in one. 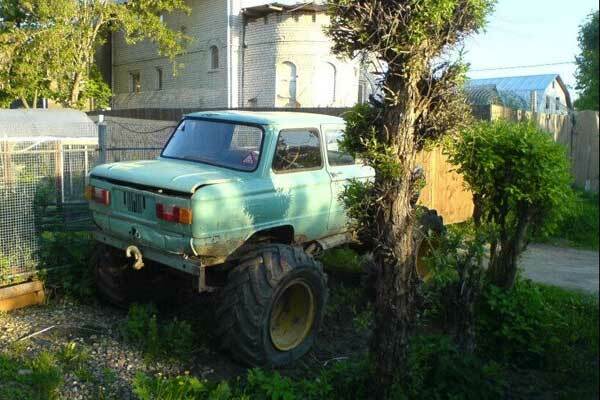 This is Lada Niva in the form of Settlers Waggon. 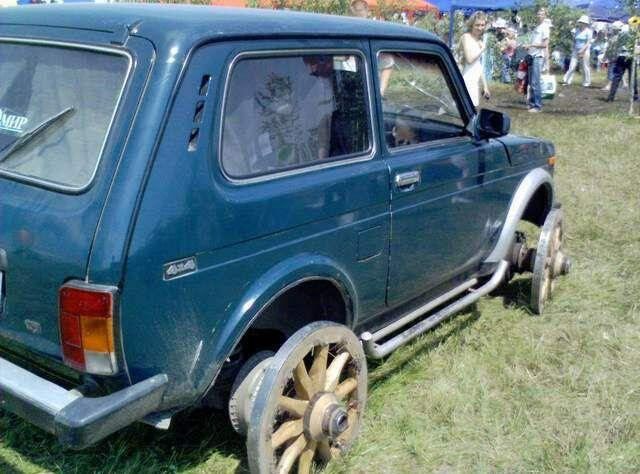 At least its wheels are from the Waggon for sure. 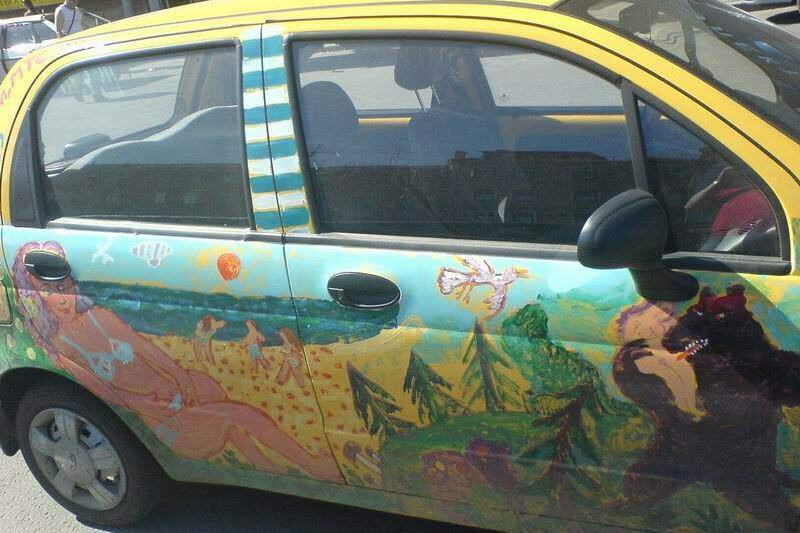 These Daewoo cars are being produced in Uzbekistan, the ex-Soviet country, it costs cheap and here we can see how it has been painted according to the Russian tradition. One can see here Russian girls and Russian beers. What more can be added? Don’t mention vodka please it would spoil the fairy tale. 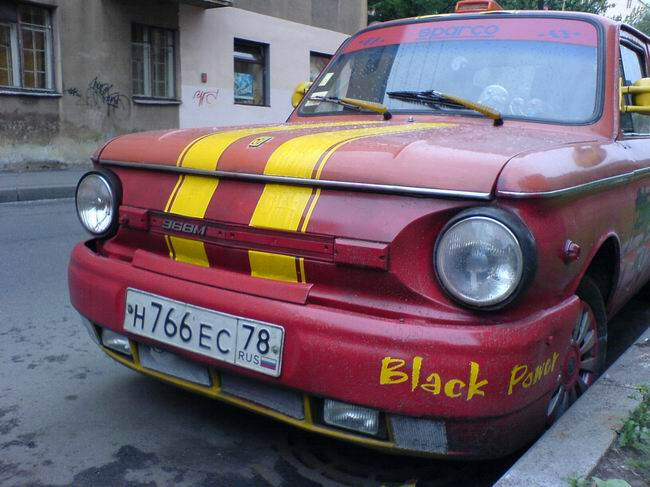 Here comes again a Zaporozhets car, now painted as a racing car. There is a big doubt that it can race. You want to know why? It has an air-cooling instead of usual cooling system, so a little more speed than necessary and you get overheating for sure. But where from can be taken and extra speed if it has only 30 hps? 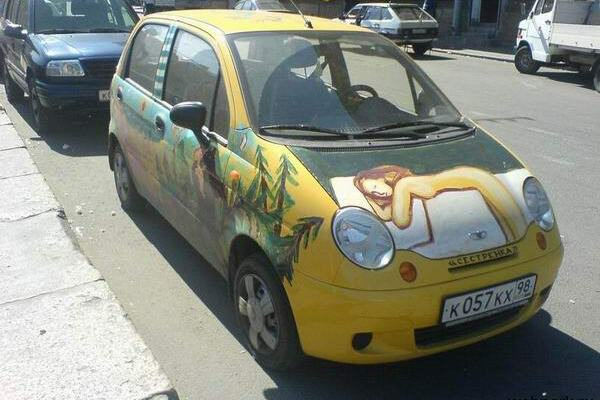 This is another piece of Russian art. This is Mr. Putin , Russian president depicted with some bats, yellow Moon and national symbolics of Russian federation. Is it a gentle hint to his black nature? 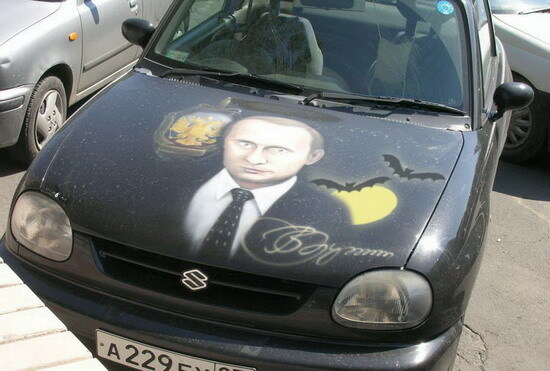 Or is a way to express the car owner’s great love for his president? Who knows. You just told us about “Russian soul”, how about you tell us about “Russian humor”? All over the world people laugh with people from other nations or race, religion, one village with another. The swedisch with the norwegian, Dutch with Belgians and vice versa. Don’t take it hard. Me, myself and a lot of other people don’t see my western European culture as superior. We also laugh with the kind of cars some people drive with,in my own country. I ‘ve seen documenturies on live in Russia. They made contact with lot’s of russians and visited them in their homes. They showed how real people were.Mostly poor but they were the nicest people you could meet. A lot of people saw that documentery,i ‘m sure they think the same way as i do. And have lot’s of respect for russian people. More than they have for most americans,believe me. I don’t like cynical tone of the authors. It is testifies to their bias. It is not the sign of the culture, I think. You need to take a difference between the joke-cars and serious tuning. And I don’t like theme of the bad roads. 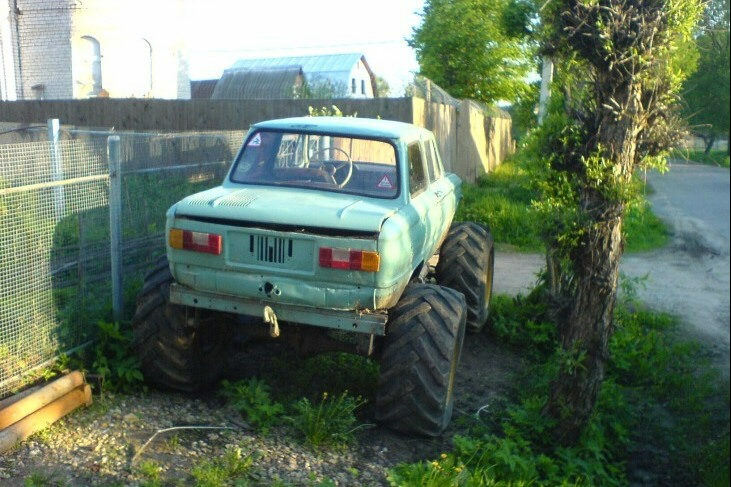 Russian roads are really not so good as in Europe or America, but not such bad as site authors are want everybody to think. And it is caused of Russian climate. The Russian “soul” is the myth of Slavophilism, the philosophical movement of the 19th century, created as an answer or response to “western” (ie modern) culture. As an explanation and thought experiment, it would be as if I decided to create a new philosophy, and call it “Americanism”. Americanism will explain why Americans are misunderstood by Russians, Asians, and Muslims. Actually, these people can not ever understand us because we Americans have this indeterminable quality that those people do not have. I will call this new, indeterminable quality “balls”. These Russians, and Asians and Muslims will never understand Americans, because they don’t have this mysterious new quality, which my new philosophy calls “balls”. Big, round, American balls, my friend … it is something you will never have. I laugh at you from the depths of my big American balls. And this is what Slavophiles sound like, when they talk from this supposed superior position about their invented Russian “souls”. It is silly to presume that your culture contains some deep and meaningful human quality that other cultures do not. I am really very sure that owner of the powder blue, jacked-up Zaporozhets with the furry bunny rabbit in the grill – takes his ride oh-so-seriously. From deep within his Russian soul. And we westerners will never understand. Blah blah blah. ilyich, no. I don’t think so. I’m not Russian and I don’t like to live in Russia, but I have no choice. I just want to restore validity and tell the truth. the zaporozecs is wery good car, well acording its cost and the time ir was made. The author probably never have seen zaporozecs racing, because they are wery good racing cars, you only have to put another engine in it, from lada 6 for excample, it will give about 80-90 Hp for that small, lightweight car, and then you got perfect car for mud races. Hey, Marius! In what century you are been to Russia? All you described is lie! If you think Russians don’t have sense of humour, then you should visit some of the Russian sites which post exactly the same kind of stuff as here – eg. http://www.fishki.net (great site by the way!). The only difference is that this site posts only negative things about Russia (which is why it’s part of your media’s propaganda), whereas Russian sites show both positive and negative sides to Russian life. But you don’t really want to see the good sides and nor do you want other westerners to see it. That’s why ALL I see and hear on the internet and on western TV about Russia – is negative! It’s just propaganda. But to you it’s freedom of speech and media of course. Sure, but for that you need BOTH sides of the story – you should know that, since you’re “supposed to be democratic”. The only way to fight this is with your own propaganda – of the good side of Russia. Build websites and blogs, tell people about the positive nature of Russian life, people, culture, traditions, etc. and spread the word across the internet. This site posts funny, interesting, and quirky things about Russia. And it’s obviously written BY A RUSSIAN. Really? I’m pretty sure he is. But no normal person (even if he really dislikes his country) is gonna post things like that day after day! It’s clear propaganda. By the way, all these photos are collected from various other websites (without mentioning copyrights of course) and they’re not “submitted by the readers” as stated below. Too bad you all fail for that. For most photos like this, posted on the internet, there are no “copyrights” – they would likely fall into the realm of fair use. There is no commercial use or profit for the original photos or for their posting here. Informal internet rules of politeness would suggest that English-Russia’s authors give credit for images and where they are obtained, however. I don’t see where everything on this website is negative, most of it is just amusing. Something like fighting oil fires in Russia is not negative, for example – just visually interesting. Articles such as the miner’s village photos are simply interesting and show what some real Russian people do for a living and what they must endure. In the past, such things would be considered a testament to the strength of the Russian people – but these days polished New Russians see such things as embarassing and making Russia look bad. But it is real, the only people who can change that are Russians themselves. For the record, what I have seen about this blog would indicate it is someone in Finland, not necessarily a Russian author. http://www.Templeof.com links back to English Russia after singing the praises of the Temple of the Internet. There is a restaurant at that address, http://www.mapledriverestaurant.com/ Could easily be a bogus street address – the Maple Drive Restaurant was formerly owned by Dudley Moore. Should also note – the listed phone number for templeof.com is completely bogus, incorrect number of digits for a US phone number and doesn’t match a Beverly Hills listing (310 area code). hahaha. Looks like the stuff they drive in Berkeley. Americans welcome foreigners with open arms. Some people would gritch and boan all the way down, if you hanged them with brand new ropes! 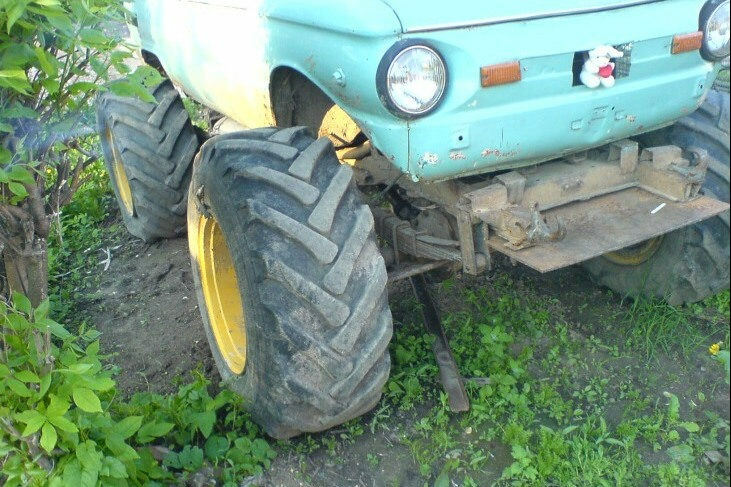 Something about the axles under that Robin’s-egg-colored Zaporozhets in the first 4 pictures. I betcha it no longer has a little 30-HP engine in the rear, to turn THOSE. Anyway, I like that one. We have a few “roads” here in the U.S.A. where such a car would be about right. Getting it through the snow or the mud would be easy. Getting it through all the legislative effluent to drive it here and not be arrested? That might never be. You still have a good thing going where you can build such a beast and drive it. We lose a little more of that, every time some new “environment” rule is written by some non-elected official with a degree in the arts. Remember legislators are like old motorcycles. Several strong kicks will be needed to get one going, and then you must stay on top of it with a firm hand, or there is no telling WHERE you could find yourself. Too many of us forgot that. Now we are all stuck with the government they deserve. Learn from our mistakes. Best regards. Well personally i think that there’s nothing to be ashamed of, look, last painted cars are museums on 4 wheels! OK, that was my opinion half a year ago. Did not intend to leave everybody speechless. It’s still my opinion. I’m still impressed by Gearheads all over the former USSR. If it gets YOU there on roads YOU have to use, you did it well. Best regards, everybody. Keep them rolling and DON’T let anyone sell you a “cash-for-clunkers” scam. Estonian site of old Russian cars and another machines.